Guys! I’ve been using Proactiv Plus for over a month now and I can’t TELL YOU what a difference it’s made. I’m not sure if you saw my “November Beauty Favorites” video but I wasn’t wearing any makeup in that clip and that is cr-azy!! I still get the occasional breakout if I eat something that doesn’t agree with me — I am SUPER SENSITIVE. If you are a regular reader, you KNOW how crazy my allergies have been lately. But I’m TELLING YOU that overall my face has never been clearer and that is beyond amazing. I’ve lived my life struggling with acne and I feel like I’m finally winning the battle. Proactiv+ is a three step breakthrough acne treatment system. It’s completely reformulated and features more medicine and more skincare benefits plus a new, smarter way to target acne. 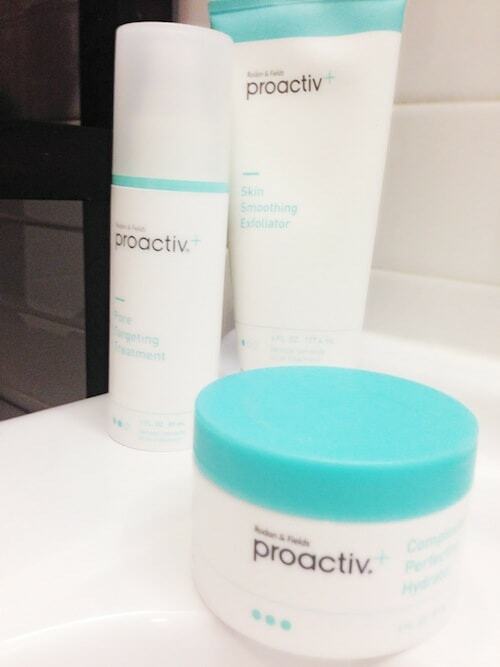 What Are The Proactiv+ Three Steps? STEP 1 – Skin Smoothing Exfoliator: A 4-1 daily face wash that acts as a deep cleanser, a medicated treatment for killing acne-causing bacteria, a glycolic acid toner AND a mild exfoliator. STEP 2 – Pore Targeting Treatment: A lightweight leave-on gel that releases benzoyl peroxide directly into the pores to clear up acne while helping to improve skin tone and texture. STEP 3 – Complexion Perfecting Hydrator: Helps common acne problems including dryness, irritation, uneven skin tone, excess oil and shine, redness, large-looking pores and more. My skin is my WORST beauty problem. Me and Proactiv Plus are BFFs for life. The system is easy and the instructions are pretty straight forward. 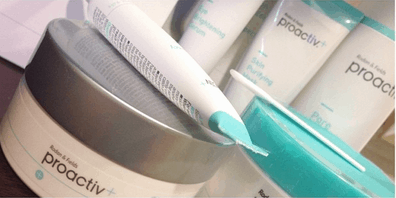 Everything is printed right on the Proactiv + tube/box. You cannot make a mistake. Each product tells you the order in which you should apply it AND what time of day it should be applied. BLISS! Interested? The Proactiv+ 3-Step System is priced at $29.95 monthly for a 30-Day supply. Available at ProactivPlus.com or by calling 1-888-710-2161. I have the Proactiv+ 3-Step System to give away to you! Give the system a SHOT. Your skin will thank you! My daughter has been asking for Proactive .. guess it’s time to get her some. My biggest issue is having blemishes yet dry skin as I’m getting older (mid-30s) – I feel like a teenager with the acne and old with the dry skin with potential wrinkles! I get serious redness but I have my troubled spots on my chin !! My most troubling/annoying skin concern is blackheads on my chin area. Mostly dry patches and frequent breakouts. My skin problem is that I am getting older and my skin is starting to sag and wrinkle. It is also very dry. So I would love to have some help with these problems. Scars from picking at my acne. I have acne, redness, dry/oily skin. My skin is either really oily or dry. Very annoying! Since I had my son, I have horrible acne! Adult acne and dry skin for sure are my big skin problems. I have very, very dry skin. My problem is large pores. Acne has always been my problem, and since post pregnancy, I have had more dry skin! I’ve had acne since elementary school and I’ve recently completed college. Nothing seems to work for me. I have acne and acne scars. I have blackheads that I can not get rid of. Also, I have combination skin, so some of my face gets super dried out, while other parts get super oily – awful!! I have problems with oily skin in the t-zone. Excessive oil and acne at my jaw line. Ack!!! Blackheads are a nightmare to get rid of! My biggest skin problem is discoloration. My oily skin, acne and discoloration. Excessive oil and fine lines. My teenage son has mild acne on his face and back that we need to take care of before it gets worse. I have occasional breakouts and if I use acne products, my skin dries and cracks and gets very painful. I have rosacea and used to use Proactiv, but haven’t tried the new version. Would love to see if it’s helpful. The skin on my nose gets oily. I still have acne even at 28-years-old. Itd be nice to get it taken care of! Thanks for the opportunity to win. I have redness on my face. Redness, wrinkles and fine lines. Acne and redness on my face, esp around my mouth area. Redness and dry skin are my concerns. Acne is my biggest skin concern.